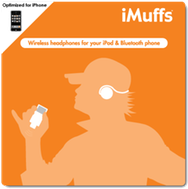 Contrary to reports published elsewhere on the Web, Macworld has confirmed that Apple did not acquire Wi-Gear, the maker of iMuffs Bluetooth headphones. “Two words: ‘I wish!’” Wi-Gear CEO Mark Pundsack said via e-mail, when asked about the rumors that Apple had bought the company. News of the supposed acquisition was helped along by the fact that Wi-Gear’s site currently says the company is out of business. In addition, the LinkedIn profile of former Wi-Gear co-founder and engineer Michael Kim now lists his position as a iOS Bluetooth engineer at Apple. But Pundsack says that there’s no truth to the purported purchase by Cupertino, adding that “Wi-Gear and its IP are still available for sale.” In a followup e-mail, he added that Wi-Gear had ceased operations due to a lack of funding. Of course, it’s certainly possible that Apple is investigating adding Bluetooth headphones to its line-up—perhaps even with the help of Kim—but it will have to do so without the benefit of Wi-Gear’s technology.